Psst.. I'm spilling my best secret to photographing kids..
All of my beach photography sessions lately have got me thinking and pushing my own boundaries. It occurred to me that I have a legit secret to photographing kids that might help you take pictures of your own kids that will make you swoon. Here it is, my secret to photographing children, especially on the beach or in the backyard in the summertime or playing in their bedroom any day of the week. It’s pretty simple: Don’t try. Say what?! I know, to all of the overachievers out there (myself included) that sounds like absolute blasphemy. But I swear to you, when I am not trying to make it all perfect, when I can let go and let my gut lead the way, when I am not preoccupied with capturing the perfect photograph, that’s when the magic happens. So, this is my one-stop advice column for photographing your kids this summer. Observe them. What are they doing right now that you wish you could bottle right up? Let them do that. Try to refrain from interfering. Be a fly on the wall. Be patient. Blend into the background and anticipate those quirky, thoughtful, lovable moments. And just let it happen. Let go of perfection: the perfect light, the perfect composition, the perfect smile, the perfect Pinterest boards. Just shoot pictures from the heart and I promise you, in 15 years, you’ll be so happy you have these photos of your kids being exactly who they are today. Here's a few favorite photographs from 2 beach sessions this month. Many break the rules with composition and lighting, but sometimes the moment and the expressions are all that matter. 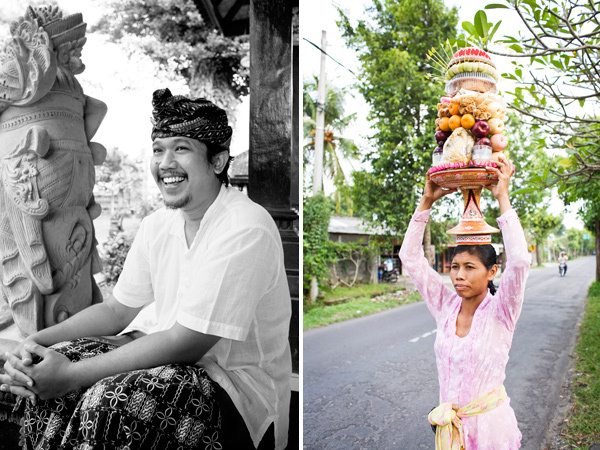 Travel portraits allow us to connect and tell stories about the places we visit. In our fast-paced, digital age, it is so easy to take a snapshot and upload it to our favorite social media outlets, all while briskly walking by. If we can make an interesting photograph without actually looking up, what happens when we stop to share a few words, look closer, and make a true connection? If you have a trip in the books or simply have a love for travel, there's a really good chance you'll snap a shot or two of a stranger now and then. How does it feel? I know, it can be a vulnerable experience for both photographer and subject, but it doesn't have to be. I hope the following tips might help you not only take more meaningful travel portraits, but also connect and honor the people you meet along the way. Photographs tell stories, but the act of making them, whether on an iPhone or Canon 5d Mark III, can add depth to our experience. While preparing for your trip, take a few extra minutes every day and study the local language. Learn a few key phrases and local slang. This delights locals and shows respect. I will never forget our very first day in Bali when our driver, Gustaaf, was a wee bit late (an hour or two). When he finally arrived full of apology, I quickly responded with “Sampunang sangsaya!” (Essentially, “no worries” in the local Baliness dialect.) He was delightfully surprised and this allowed our first exchange to be one of laughter, smiles, and mutual respect, despite the late start. 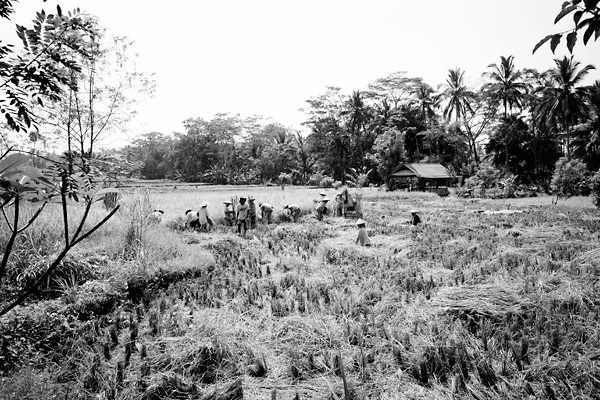 Whenever possible, it was my goal to communicate with locals in Indonesian or Baliness. Their delight and warm smiles in return never grew stale and this connection allowed me to create beautiful portraits, beyond typical travel snapshots. It’s not always so easy. In the small fishing town of Hopkins, Belize, even though there was no language barrier, I found making portraits of the locals much more challenging than in Bali. However, the same lessons were revealed. Approach someone with a smile, compliment them, show respect, and ask politely to take their photograph. Many people in Belize, mostly men, declined. As a photographer who is visualizing a killer shot, it is hard to walk away, but it is more important to show the upmost respect. Once you’ve made a genuine connection and you have your subject’s permission, “zoom” by moving your feet, rather than just the focal length of your lens. Think about how it feels when someone points a camera at you – perhaps you are a closet supermodel, but I assume most us get a little sweaty palm action as the self-consciousness creeps in. Therefore, for the following series of images, I began by kindly approaching this lovely woman as she washed her dishes. Realizing I was stepping into a stranger’s personal space, with immense respect, I complimented her on the color of her beautiful home, her adorable kids, and how the light was just perfect. When she obliged to my request to take a few photographs, I started by stepping back to document the entire scene with a wide vantage point. Then, I moved in closer for a full-length photo of her daughter, as I sensed she was open to my camera. Finally, as I interacted and sensed her comfort, I took a close-up portrait, which fit my original vision. As a token of gratitude, I showered her with compliments as I showed her the images I had captured. Know your camera, be quick, and continue to connect with a smile as you shoot. This intentional approach not only allows your subject to ease into having their portrait taken, but it also gives you a diverse collection of images from a variety of vantage points. Environmental portraits tell a story about a person by incorporating their surroundings. When I took these photographs of Caitlin, a local to Hopkins, Belize who is originally from Ohio, I dug deeper by documenting her quaint bakery off the beaten path and the subtle details within. Caitlin is full of life, inspiration, and spirituality and shares it openly. She works tirelessly to support her family with her bakery and her devotion to both is apparent through the spark in her eyes and the tiniest details of her environment. I was intrigued by her story and found the more I photographed, the more I learned, simply by slowing down and looking closely. Remember, to travel is to explore what is unfamiliar, and to photograph with openness is to connect unconditionally. Always show respect, understanding, and gratitude and I promise you’ll make some pretty amazing photographs (and connect with some fascinating people) along the way. Isn’t it fascinating how difficult it can be to let go… Letting go of perfection, expectations, and the pressures we place on ourselves is HARD. Yet, it isn’t until we truly let go that we are able to see what is waiting to be revealed. And often times, it is actually perfect... the kind of perfect we can’t expect or control. It just happens. It is not uncommon for me to prepare my clients in this way. It has become a mantra for my work. I truly believe that the best moments happen when we have fully let go of pressures and expectations. Not only are children most at ease when adults are at ease, but my best photographs also happen when I am able to get lost in my surroundings without worry. As I prepared for this session, however, something was different. My client didn’t need a lick of advice or preparation. She gets it. She wrote me candidly about her life’s potential changes to come and how meaningful it will be to capture some special everyday moments with her 3 year old son. She told me how she loves the way they snuggle up in her bed first thing in the morning, the way they lie on their bellies… she expressed how they love to cook together and explore their favorite hiking trail. As we brainstormed ideas and planned our session, I quickly realized that I was battling my inner perfectionist. I was worrying about not having enough light in the bedroom at 8:30am and ending up outdoors when the sun is so harsh. But, perfection is not the goal, here. Instead, my goal is to be fully present in order to capture true “day in the life” moments as they naturally unfold on this ordinary day, regardless of when and where the light will be “best.” It didn’t take long for me to step back and take my own advice. I needed to let go. And the result – a perfection that I could not have predicted, planned, or pre-visualized. So, maybe this 3 year old was in “bad guy” mode on this particular day... and maybe he put his shirt on backwards... and maybe he fought the getting ready routine, which resulted in sporting his bed-head hair for the rest of the day. And maybe there was barely enough light in the bedroom and we ended up shooting outdoors at nearly high noon. And maybe it didn’t matter. We chose to not let it matter. In all of its imperfection; it was pretty perfect. And that is typically how it goes. 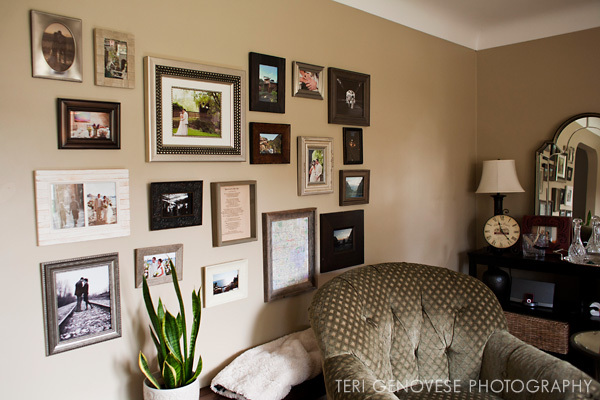 This approach is perfect for wall arrangements that you hope to add to or change over time. In this case my client combined a wide selection of special photographs, from the photos I captured from her engagement session and wedding portraits/reception to their trip to Italy and their destination wedding/honeymoon in St. Lucia. 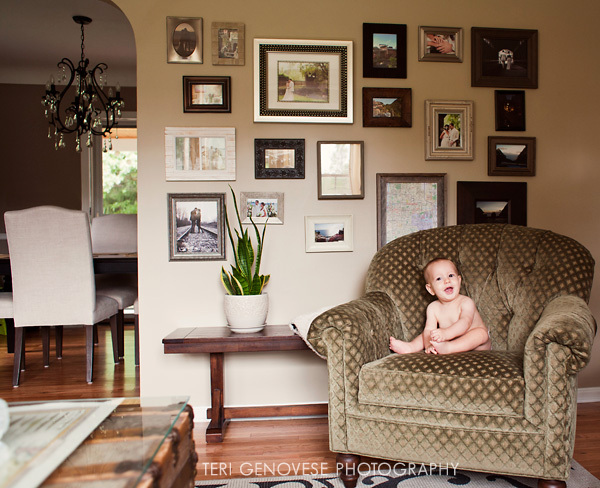 I love that this wall arrangement is a focal point in their living space and celebrates their life before this little bugger came along..
1) Choose your favorite photos. Get a basic idea of what sizes will be needed to fill the space. Record the quantity of horizontals, verticals, and squares (and your preferred sizes for each). 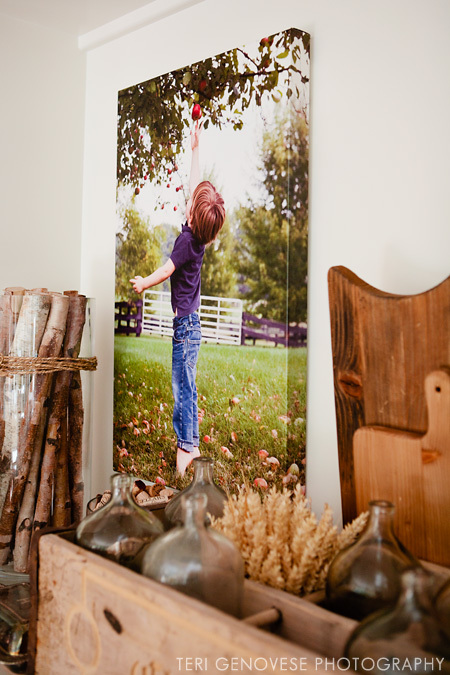 Go with your gut and feature your absolute favorite photographs as the largest prints in your display to act as the focal points. 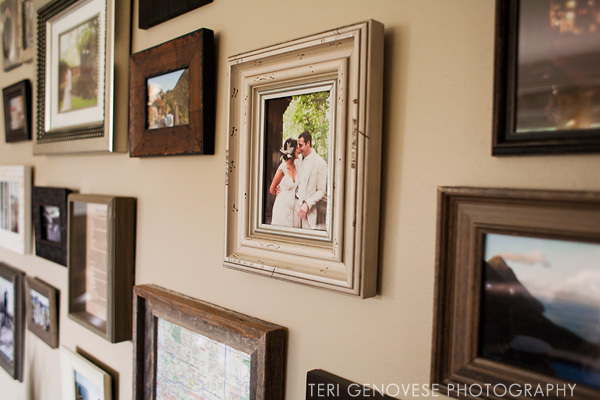 3) Simply lay out the framed photos on the floor and move them around until they feel balanced. 4) Transfer the frame layout from the floor to the wall. Surprisingly, my client reported that they just eye-balled the layout without measuring a thing! It may seem too easy, but this is the key to give the look of a casual, organized yet random wall arrangement. 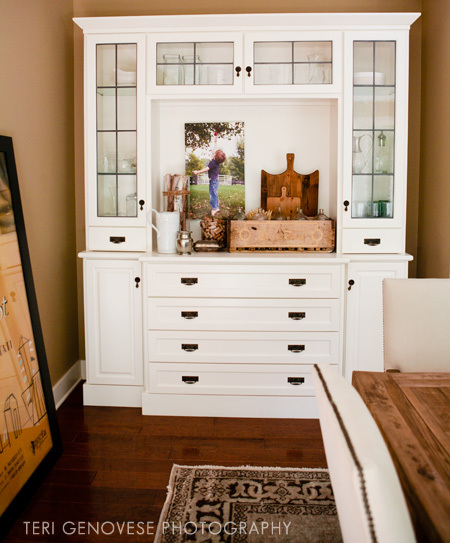 I was so intrigued to see this canvas hung inside this stylish family's buffet cabinet / hutch. It is so perfect and untraditional. It really inspired me to think outside the box for new ways and different areas that can be decorated with photographs. So many people express that they do not have any wall space, but that's when we can get really creative..
For reference, the size of this canvas is 16" x 26." It's such a treat to return to a client's home after some time has passed and see how they have displayed the photographs from our sessions together. Besides having total house envy, I am often so impressed with the finished result and how my photographs have been incorporated into their personal home decor. A huge thanks to my clients for allowing me to share their beautiful photography displays. I hope these examples and tips will help inspire ideas for incorporating your photographs (professional or personal) into your home decor. Have fun with it! Is it just me or does it seem like we are taking more and more photos every year and printing less and less? In film days, obtaining prints was an automatic byproduct of the process. It was so easy. Digital photography is amazing, but no doubt creates more time consuming challenges when it comes to keeping images organized and printed. I recently tackled a daunting project that I had been putting off for over a year. (It happens!) My goal was to combine our favorite photos from 5 years of living in California – 5 years worth of weekend trips and getaways exploring the west. For many, many months, even just the thought of the project would paralyze me and I’d choose to organize my closet instead. When I stumbled upon Pinhole Press, I knew I had found my match. Pinhole's minimal design aesthetic and simple work flow solutions turned this overwhelming personal project into a breeze. 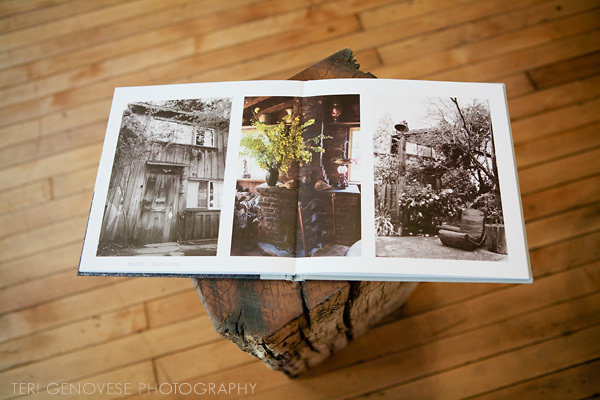 Because I’m such a geek over a good photo book, I wanted to share these images. 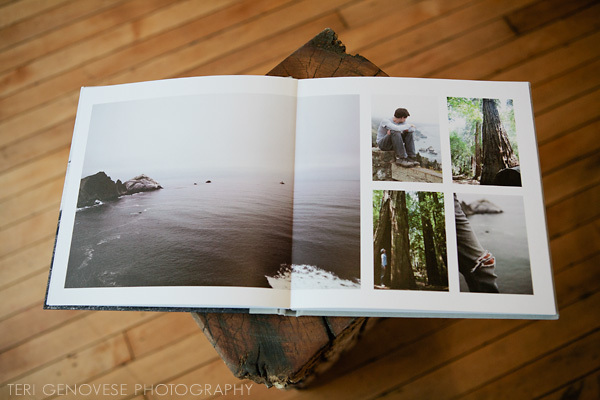 This is a 60-page Panoramic Book printed with recycled paper. Can you imagine not having printed photographs of your current life and adventures to look back on, the way we flip through our parents’ and grandparents’ pictures? JPGs, hard drives, and discs may not last forever, but printed photographs will. If you have questions or need advice or encouragement to get started on a project, please email me or post a comment. I love helping people learn how to better organize digital photos and I completely understand how overwhelming it can become! For the sake of full disclosure, I am a partner/affiliate with Pinhole Press, but only because I 100% love their products and use them for my personal photos.